In 18 43, area families built a one-room log cabin near the Lyonsville Church to use as a school–this was the first school in Lyons Township. Plainview School District # 106 and Pleasantdale School District # 107 trace their beginnings to this log cabin. Pleasantdale: Its’ History in Commemoration of the Bicentennial, pages 18-21, provides a brief history of the Pleasantdale schools. In 1861, a one-room schoolhouse, known as the Flagg Creek School, was built and was part of School District # 3. In 1901, Flagg Creek School became affiliated with School District #107, and at some point the school’s name changed to Pleasantdale. In 1887, a fire destroyed the building, and a new one-room schoolhouse was built, which served the community until 1927 when it also was lost to a fire. Fortunately, Miss Marie Derby, the school teacher, kept her wits about her when she saw flames shooting out from the walls, and quickly called a recess. Once outside, the students realized the danger that they had escaped as they watched their school burn to the ground. The students continued with their classes first at the Edgewood Valley Country Club and then in the Lyonsville Congregational Church basement. In September 1928, a new modern, two room brick school building opened. Irving Keller, a graduate of the Flagg Creek School, was the builder. 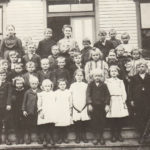 Pleasantdale School educated many of the early Flagg Creek area families whose daughters returned to teach at the school—including Ruth Vial Martin who taught from 1921 to 1923.